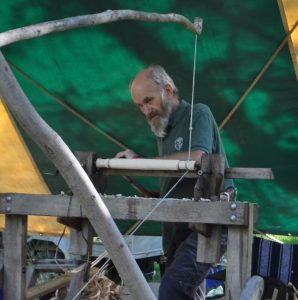 Green woodworking enthusiast that loves to create and to pass on his skills and knowledge. We used the same approach making John’s pole-lathe and shaving horse with measuring, marking out, cutting and shaping the components as we did with the work bench. The bench made much of the work easier but I got the leg length wrong and four inches needs to be cut off to make it even more useful. We had to leave that job to John after our departure. Prossy had returned home from her weekday home in Busia to help in the work. She arrived on Saturday morning riding her Dad’s motor bike. This was quite a surprise as it is perhaps only the second time that I have seen a woman riding a motor bike in Uganda. Later in the day I had a short ride around the house only to find the front brake had no cable. I can’t imagine driving with no front brake on the road, scary stuff. The photographs show some of the work with the main team members. One notable exception is John’s dad, Deogratias, who took on working with the person using the brace and bit to maintain a vertical or horizontal line. Initially there was great confusion as he and the others assisting him used their own versions of guidance. I suggested strict terms which had to be ‘towards the house’ and ‘away from the house’, and ‘towards you’ and ‘away from you’. This took a while to get used to as accuracy with boring holes was new to the team, even John, a carpenter. To give you a feel for how the guidance sounded, just think of Nelson Mandala saying ‘towards the house’. I’ll treasure that memory. It was also suggested that I’ll be remembered, not for making the equipment but for ‘towards the house’. These directions eventually became second nature and had amusing modifications such as ‘towards the orange’ and so on. I should point out that there were plenty of oranges available as John’s uncle had a plantation on the family land. Also that we ate the ‘oranges’ green, straight from the tree. Amazingly good. Bit by bit it all came together and amazingly the lathe worked well on the first attempt with minimal fine tuning to increase efficiency. We took some video of this with John, Lillian, Prossy and myself having a go. I’ll try and upload the video during the evening as uploads with photographs takes a fair time and a video likely to be a very slow process. The following photos show some of the work in progress. I’d like to add at this point that I’m attempting to raise some funds to help pay for some of the tools, materials and green wood for turning. This is a Just Giving account, details are available somewhere on the blog, but I’m not quite sure where or how to connect to the page if you are able to help. If you can offer any guidance on this and any other feedback about the blog I would be more than happy to receive your comments. Also for you to clients click on the ‘Follow OmubaziMike ‘. Mike guiding Lillian in Lyantonde February 2017.